Raghuram Rajan has been mooting several radical ideas. How practical are they? If we are to achieve results never accomplished before, we must expect to employ methods never before attempted," said the 16th century author and statesman Sir Francis Bacon. Raghuram Rajan, the 23rd Governor of the Reserve Bank of India (RBI), may well have been inspired by Bacon. RBI under Rajan is talking of a radically new approach to achieving financial inclusion and creating a financial infrastructure for the new millennium. 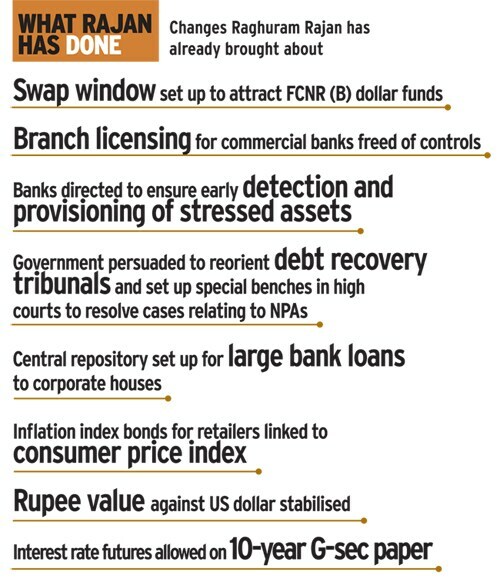 In his five months at the RBI's Mumbai headquarters, the central bank has come up with ideas that were never considered before. Consider, for example, the move to have bank accounts for all citizens by 2016. Or the initiative to raise over $5 billion in September, without having a sovereign bond issue, to combat the rupee depreciation. This was achieved through a swap facility to attract NRI funds. The masterstroke was Rajans decision to go after black money and fake currency by simply withdrawing currency issued before 2005. Many of the existing banking practices and regulations were given shape several decades ago. The RBI Act itself was drafted in the pre-Independence era, Winds of change have been blowing globally for some time and the RBI needs to respond to them. The emergence of electronic payments is transforming a poverty-stricken continent like Africa. 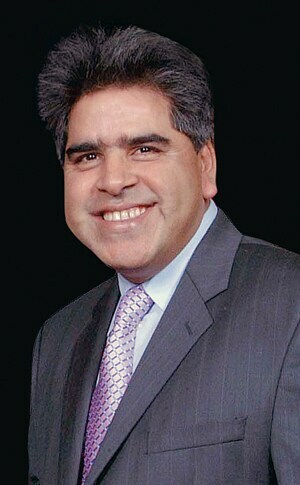 "The technological revolution bodes well for India. It can leverage payment technologies to bring about financial inclusion," says Raj Jain, Chairman and Managing Director at RS Software (India) Ltd, a technology company. Today, 60 per cent of Indias population does not have a bank account. In addition, about 90 per cent of small businesses have no links with formal lending institutions. Efforts to achieve financial inclusion have failed to deliver adequate results. Rajan sounded out his Indian Institute of Management (IIM) Ahmedabad classmate Nachiket Mor, now a member of the RBIs central board within days of taking over, for ways to cover small businesses and low income households. By January, the Mor committee had come up with the concept of "payment banks" with initial capital of Rs 50 crore, one-tenth of what a full-service bank requires. These banks could be set up by existing banks as subsidiaries or by consumer goods dealers and mobile phone companies, non-banking finance companies (NBFCs) and the post office system. Payment banks will only accept deposits and not do any lending. But some question the need to create another structure in addition to the existing banking network. "The infrastructure of mobile phone outlets and kirana stores already exists," says Mor. This obviates the need to set up more new branches and payment banks can begin offering basic banking services on getting a licence, he adds. Mor has also recommended allowing NBFCs to set up wholesale banks which will accept wholesale deposits (not retail) and engage in lending activity too. Mor reasons that the best incentive for financial inclusion is to create competitive pressure in the system. The second important recommendation of the Mor committee is to have bank accounts for all by 2016 by linking them to the Aadhaar numbers of citizens. But not many are convinced. They say the larger issue is of simultaneously strengthening the banking infrastructure and raising standards of living. "Financial inclusion definitely cannot mean just the opening of a bank account. It also cannot be done only by the banks. 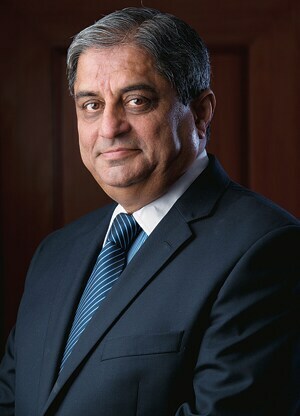 You have to have financial viability, telecommunications, power, water, roads and then banks can follow," said Aditya Puri, Managing Director of HDFC Bank at a recent Indian Bank Association function. Two of the Mor committee members - Shikha Sharma, Managing Director and CEO, Axis Bank, and S.S. Mundra, Chairman, Bank of Baroda - have stressed the need for providing the complete bouquet of financial services which wont be achieved through payment banks. "But not everybody needs credit and not everyone who asks for credit should get it. Credit has to be given much more carefully," says Mor. Rajan is yet to take a call on the Mor committee report. On his very first day, Rajan also talked about a new approach to formulating monetary policy. Rajan picked Deputy Governor Urjit Patel to take a look at what more needed to be done to strengthen the monetary policy framework. The Patel committees report talks of inflation targeting as the sole objective of the monetary policy and has insisted on using the consumer price index (CPI) instead of the wholesale price index (WPI) for determining interest rates. The CPI itself is a very new series with no long history. The share of food component is very high in the CPI, almost half, which limits the impact of the monetary policy on the index, say analysts. "There is nothing wrong, theoretically or conceptually, in using CPI as a nominal anchor, but I dont think it will work as monetary policy cannot influence any significant component of the CPI," says Madan Sabnavis, Chief Economist at Care Ltd. In the third quarter review of the monetary policy in January, Rajan has made a reference to CPI, which shows he obviously sees merit in using it as an inflation anchor. Patel committee has also suggested forming a five-member monetary policy committee (MPC) to decide policy action. These two radical ideas are in direct conflict with the recommendations of the government-appointed Srikrishna panel on Financial Sector Legislative Reforms. Srikrishna report, submitted a year ago, has clearly spelt out the governments role in giving quantitative monitorable objectives to RBI for monetary policy formulation. The mandate of the RBI spelt out in the Act is to support growth, financial stability (of the banking system) and price (inflation) stability. "The objective that the RBI must pursue would be defined by a central government and could potentially change over the years," added the Srikrishna report. The composition of the MPC suggested by the Patel committee - with RBI Governor as Chairman, a deputy governor, executive director and two external members - is also in contrast to the Srikrishna committee recommendations. Srikrishna has suggested a seven-member MPC, which includes the RBI Governor, one executive director from the RBI and five external members. Out of the five external members, two will be appointed by the Governor and three will be by the government. Clearly, the government wants to have a say in the monetary policy decision-making whereas Rajan appointed committee is tilted in favour of the RBIs independence. Many were surprised when on the very first day of assuming office in September last year, Rajan talked about internationalisation of rupee. "This might be a strange time to talk about it, but we have to think beyond the next few months," said Rajan. It actually means acceptability of the Indian rupee for settlement of cross border transactions globally like the dollar. 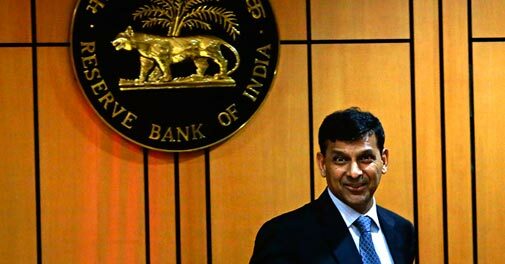 Rajan spoke about internationalisation when he was actually expected to do some fire fighting to save the rupee from depreciating against the US dollar. The rupee breached the 68 mark last August against the dollar. "That may be his long term plan," says Rohit Wahi, CEO and Country Head, FirstRand Bank India. Internationalisation is a sensitive issue as it first involves capital account convertibility. This might make the rupee volatile and it might eventually depreciate because of a large current account deficit. A report authored by two RBI executives in May 2010 said: "It depends on market forces, i.e., how much faith the market has in that currency, which in turn depends on various factors, such as size of the economy, level of financial development, stability, etc." 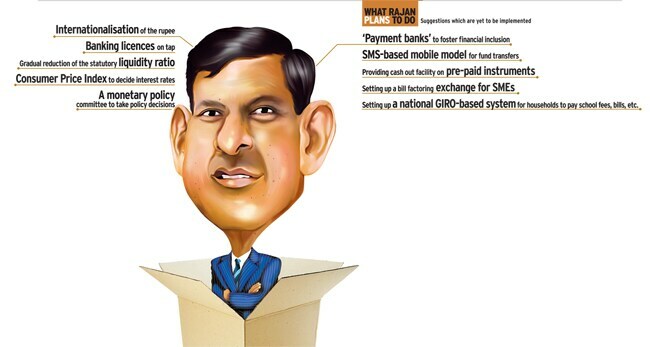 Rajan is quick to spot the growing non performing asset (NPA) menace in the banking sector. While his measures for early detection of bad debt are laudable, the second leg of NPA resolution, which depends on the courts, requires an overhaul of the legal system. The RBI plans to take up with the government concrete suggestions on reining in NPAs. These include creation of additional debt recovery tribunals, creating special cadre of officers and a separate bench for speedy disposal of NPA-related cases. Recommendations may also be made to the government to expedite setting up of special benches in every high court for corporate cases. "But these things will take years," says an official of an asset reconstruction company. The governor wants to reduce the SLR (statutory liquidity ratio), which requires banks to invest 23 per cent of the deposits in government securities. "This (reduction) cannot be done overnight, of course. As government finances improve, the scope of such reduction will increase," said Rajan in his very first media interaction. The banks today hold 28 per cent SLR, more than the stipulated amount, because of shrinking lending opportunities in an economic slowdown. "Commercially speaking, banks are finding it more comfortable to hold risk free G-Sec," says Sabnavis. Separately, Rajans idea of allowing fund transfers by way of an SMS system also looks ambitious. 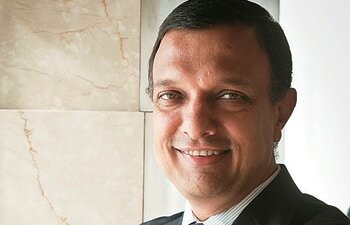 "It actually requires installation of encrypted software in every handset," says Uttam Nayak, Country Head at Visa India. And thats a challenging task to have such an encryption with handset manufactures spread over different geographies. Clearly, Rajan is not looking at band-aid solutions to fix the larger structural issues and has set an ambitious agenda for the central bank. Can he pull if off? For the moment, Rajan exudes confidence that he can ring in far reaching reforms.